Single Bath Towel size 75x125cm. Your choice of towel colour. Single Bath Towel size 75x125cm. Your choice of towel colour. Personalised with your choice of text; name, initials or nickname. Select the letter font style. We will embroider the love heart and name in lovely red thread. A unique gift for your sweetheart and Valentine. 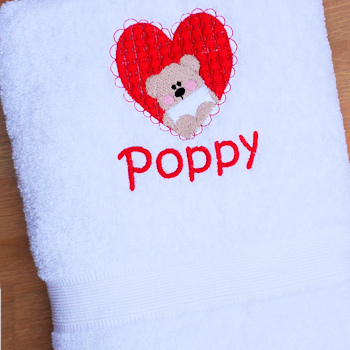 At Amys Gifts we do our own embroidery work especially made to order.